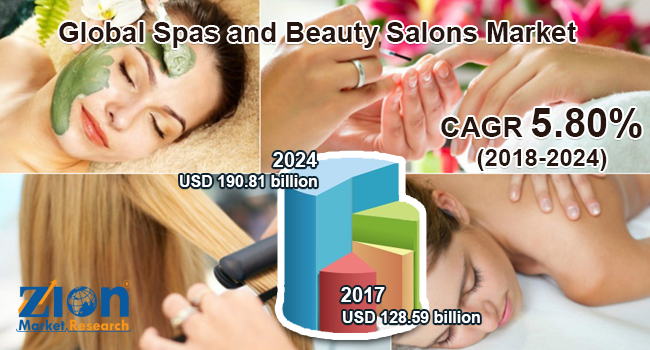 Global spas and beauty salons market expected to reach approximately USD 190.81 billion in 2024, growing at a CAGR of slightly above 5.80% between 2018 and 2024. Global spas and beauty salons market has a huge potential comprising of both men and women beauty and personal care products and services. The report covers forecast and analysis for the spa and beauty salons market on a global and regional level. The study provides historical data from 2015 to 2017 along with a forecast from 2018 to 2024 based on revenue (USD Billion). The study includes drivers and restraints for the spa and beauty salons market along with the impact they have on the demand over the forecast period. Additionally, the report includes the study of opportunities available in the spa and beauty salons market on a global level. This report offers comprehensive coverage on global spa and beauty salons market along with, market trends, drivers, and restraints of the spa and beauty salons market. This report includes a detailed competitive scenario and the product portfolio of key vendors. To understand the competitive landscape in the market, an analysis of Porter’s Five Forces model for the spa and beauty salons market has also been included. The study encompasses a market attractiveness analysis, wherein all segments are benchmarked based on their market size, growth rate, and general attractiveness. This report is prepared using data sourced from in-house databases, secondary and primary research team of industry experts. The study provides a decisive view of the spa and beauty salons market by segmenting the market based on type and region. The type segment is divided into spas and beauty salons. The spa segment is further fragmented into day spas, club spas, medical spas, destination spas, mineral springs spa, and resort and hotel spas. Beauty salon segment is sub-segmented into a hair salon, waxing salon, nail salon, tanning salon, facials and skin care salon, and a full-service salon. All the segments have been analyzed based on present and future trends and the market is estimated from 2018 to 2024. The regional segmentation includes the current and forecast demand for North America, Europe, Asia Pacific, Latin America, and the Middle East and Africa with further country wise bifurcation include the U.S., the UK, France, Germany, China, Japan, India, and Brazil. The report covers a detailed competitive outlook including the market share and company profiles of the key participants operating in the global spa and beauty salons market are Metropolis Salon & Dry Bar, The Roose Parlour and Spa, Butterfly Studio Salon & Spa, Robert James Salon and Spa, Muse Salon & Spa LLC, Metodo Rossano Ferretti Salon, Paul Labrecque Salon & Spa, Madeline Wade, and Salon U, among others.